Not always one comes across two political rivals embrace each other in one place. But, this happened on the outskirts of Silchar Town of Assam, at Berenga Eidgah, when thousands congregated to offer namaz on the occasion of Eid ul Adha on Wednesday. As thousands of denizens of the muslim community flocked to Berenga Eidgah, situated just about three kilometres from Silchar Town and falls under Bereng Gaon Panchayat, a carnival like atmosphere could be seen on Wednesday morning. Young and old rushed to this Eidgah which was established in 1939, to offer namaz on this auspicious day. A day of devotion and sacrifice for which Lailani Jakat a ritual of collecting money in the name of Allah and all round development of this mosque was also wished. 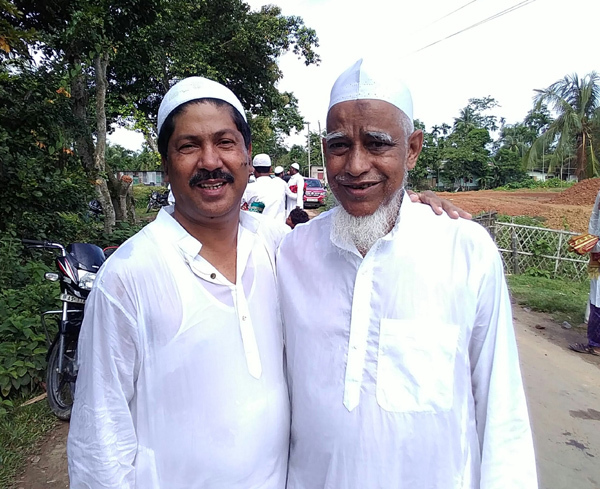 The Northeast Now correspondent caught up with two of the leading politicians of Cachar district in Assam offering their namaz, and later, as part of the customary practice, embraced each other and wished for each other’s good health and spirits. On being quizzed by Northeast Now correspondent about the National Register of Citizens’ (NRC) processes that is currently going on in the state, both the leaders in union, said, that the process for claims and objections are in place and legal discourse too has been extended, for which, no genuine Indian citizen should fear being left out from the final NRC list. Before leaving, both these leaders wished all readers a better society and better days ahead.